BITSAT Admit Card 2020: Birla Institute of Technology and Science Exam Conducting Body will be releasing the BITSAT Admit Card. The BITSAT Hall Ticket for the candidates who will be enrolling for the BITSAT 2020 Examination. Students will be asked to download the BITSAT Hall Ticket since it is the only document that would ensure entry inside the examination venue. The Hall Ticket is to be produced upon being asked inside the examination venue; without which the entry would be prohibited. The Candidates will be able to download their respective BITSAT Admit Card from 2nd week of April 2020. The candidates can download their hall ticket from the official website of BITS. In this article, readers will learn about the BITSAT Hall Ticket 2020, its release dates, downloading procedure, and other important details. BITS will be releasing the BITSAT Admit Card/ Hall Ticket for the candidates, tentatively, around the 2nd week of April 2020. It will be prudent to know the schedule in advance so as to not miss out any important events. Given below is the tentative schedule for the BITSAT 2020 Admit Card Release and related events. 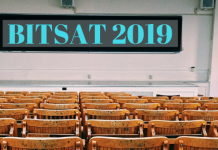 Download the BITSAT Admit Card 2020? BITSAT Admit Card will be available online on the official website of BITSAT. Candidates will have to keep checking the official website for notifications regarding the BITSAT Admit Card which will, provisionally, be available by the 2nd week of April 2020. The Hall Ticket is an important document that needs to be kept safe and has to be produced at the examination venue up on being asked. Candidates can simply follow the steps given below. Check all the details entered and make sure they are correct. Note down all the important details such as Roll Number, Date and Time, Venue of Examination Centre. BITSAT Admit Card 2020 is a piece of document which allows the entry of the candidate to the examination venue. Given below is a head’s up for the candidates in terms of what they will find upon accessing the BITSAT Admit Card. 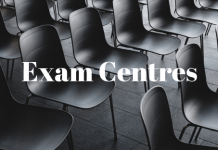 Being one of the most important documents in the whole BITSAT examination process, the BITSAT Hall Ticket comes with a set of instructions for the candidates to follow up carefully. These instructions must be necessarily followed. Some of the highlighted points that need to be considered while going to be appearing in the BITSAT Admit Card 2020 are as follows. Reaching before the prescribed timing is a must for the candidate. Candidates who come late will be barred from entering inside the premises. Candidates must bring in the following documents for the examination – BITSAT Hall Ticket; Passport size photograph pasted on the attendance sheet at the exam centre (Please note the photograph should be identical to the one uploaded during filling of the application form); Candidates belonging to PwD category will have to carry a copy of the PwD certificate in the prescribed format; A valid ID proof – PAN card/ Driving License/ Voter ID/ Passport/ Aadhaar Card/ Ration Card. Candidate need not bring any pen or pencil inside the examination hall as the authorities will provide one. Gadgets such as phone, pager, or calculator will not allow inside the exam premises. Watches will not allow inside the examination hall. No candidate will allow leaving the examination hall until the time isn’t finished. 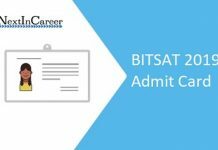 2 Download the BITSAT Admit Card 2020?